During the last ten days, we have seen several groups of sunspots. Is the the sun coming out of its funk? If so, it would lessen the chances of global cooling that some have warned of. The only thing we can do is watch, because there is no scientific expertise (at least that I know of) at forecasting sunspots in the short term. For much of the last three years, we have experienced a "blank sun." 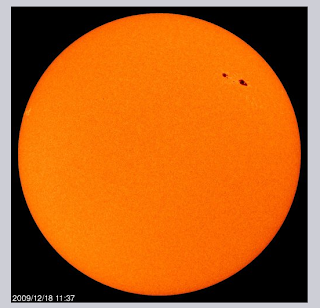 At times in the past, extended periods of low sunspot activity have been associated with cooling such as the Little Ice Age. It will be interesting to see how this plays out. By the way, if you wish to view sunspots, you can look at real-time solar images here.